It scares me how quickly Halloween is creeping up on us again this year. Now that the kids are back to school, it’s time to think about what wickedly crazy things we can do to make this Halloween ‘Spooktacular’. 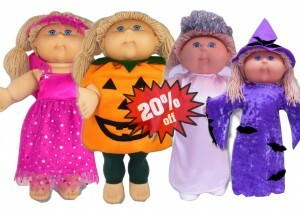 Why not make some super spooky or frighteningly fun costumes for your dolls? After all, why should they miss out on all the Monster Madness? And just think of all the extra candy you will collect if your doll has her own special Halloween candy bag. 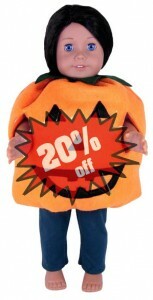 To ensure your doll gets to join in on the fun of trick or treating, I’m taking a Monster 20% off all Halloween Doll Clothes Patterns from now until midnight October 31. Just like with all my doll clothes patterns, these Halloween patterns come with downloadable pdf pattern pieces, written instructions and 12 months access to very detailed step-by-step video tutorials where I show you how to make these cool Halloween costumes. “Sew” what are you waiting for? Take advantage of this Spooky Special today!